WM Splitter is a really easy audio and video editor and file joiner. Simply load a video or audio file into the program and place markers along the timeline where you want to exclude, or keep, a potion of the file. You can mark your sections using a variety of navigation tools that give you precise control, including frame-by-frame, time based, and even K-Frames (new camera shots). Once you have finished marking the section you simply press the "trim" button and your edited file is saved, along side your original file. WM Splitter has a "join manager" that allows you to easily join files of the same file type. It's super fast and easy. 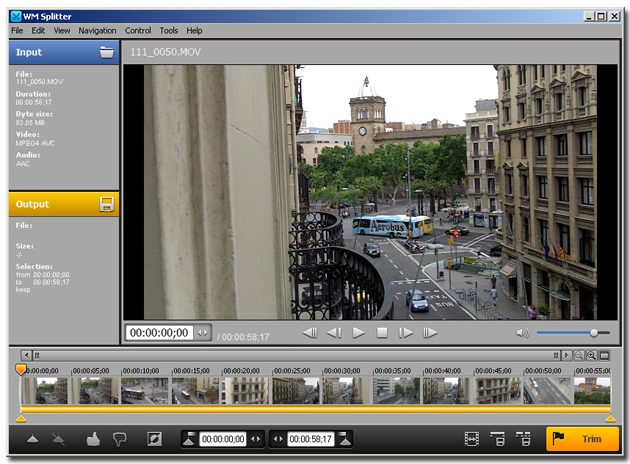 WM Splitter edits these popular video and audio formats: AVI, WMV, ASF, WMA and MP3. The program is super fast. You can remove commercials from all your favorite videos or trim dead air away from all your favorite MP3's. Use this program to get all your favorite files in exactly the shape you want them. Even a computer novice will have no trouble figuring out how to use this program. • New registration system. Fixed issues with editing WMV files. Fixed issue where quicktime player would not play trimmed and joined mov files with aac audio.